When I was in high school, the furthest thing from my mind was looking stylish when I was on the tennis court. I would throw on some old tee shirt and gym shorts – whatever I could find that was clean. Fast forward a few years later and things have changed a great deal! Back then I dreamed about owning anything from Lacoste. It was a brand I associated with helping me look good when I played the game and also allow me to move easily and gracefully across the court. Today I have a deeper appreciation for the fabric Lacoste uses in their apparel, whether it’s a shirt or this gorgeous jupe . There is something luxe about this dress that not only fits me like a glove but also allows me to sprint easily around the court. To help complete the look and keep my eyes protected from the sun, I threw on this hat that goes perfectly with the jupe. And lets face it, I can’t resist their cute alligator logo, so I had to get this cute bag too. Just because you get sweaty when you play your favorite sport, doesn’t mean you need to sacrifice on style. 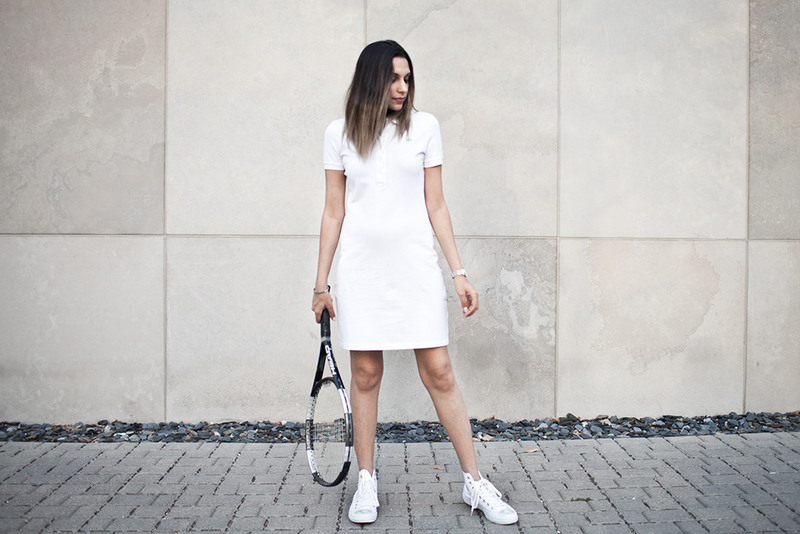 Love this classic tennis look! So chic! Love this sporty look! beautiful. Loving this outfit! Lacoste always does it right! What a nice look, absolutely love it! Such a classic brand and look!